Leveraging on our vast industry experience and knowledge, Venture Scrubbers and Wet Scrubbers have emerged as one the distinguished manufacturer and supplier of Dust Burning Scrubber. The offered scrubber is manufactured using basic material and sophisticated technology in adherence to set industrial norms. It is used for various purposes in a number of industries. We offer this scrubber is various technical specifications for our clients to choose from. 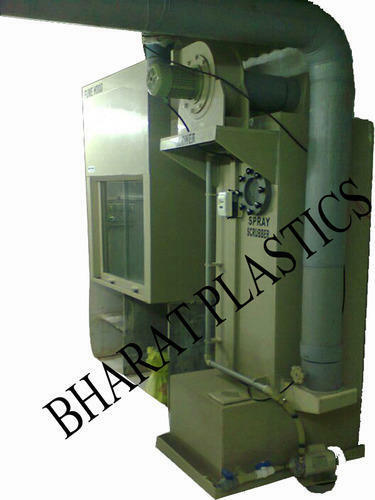 Incorporated in the year 2007, at Mumbai, (Maharashtra, India), we, Bharat Plastics are one of the leading manufacturer and supplier of Fume Hood, Gold Refinery Machine,Single Stage Fume Scrubber, Hand Wash etc. These are made using qualitative raw-material procured from the trusted vendors and are availed at market leading prices. Our products are widely known for their cost-effective systems, error free nature and low-cost. Our products are widely used in various industries. All our products are stringently quality tested under various parameters and are made as per the set international standards. Our organization is highly engaged in catering the clients who are invited for asking their queries of our valued buyers for their further clarifications.